Joe Rantz was the second son of Harry Rantz and Nellie Maxwell. Harry was an intelligent man who’d been inspired by the Wright Brothers’ experiments with flight, and later built his own an automobile. His wife, Nellie, was a piano teacher and a minister’s daughter. They lived in Spokane. Harry kept a busy schedule, running his own automobile repair shop, while Nellie continued teaching piano. But when Joe was still a young child, his mother died of throat cancer. His older brother, Fred, went off to college, and Harry fled to Canada, scarred by his wife’s death. Joe contracted scarlet fever and nearly died; afterwards, he was raised by his aunt, Alma. Joe Rantz’s life was marred by tragedy after tragedy; as a result, he grew up without the close familial relationships that many people take for granted. He wasn’t close with either his father or his mother, and his early traumatic experiences trained him not to depend too heavily on other people. Of the two people on whom he depended most heavily as a young child, his mother and his father, one died and the other ran out on him. In 1919, when Joe was only five years old, his older brother Fred arranged for him to come out to Pennsylvania, where Fred was now living and working. Fred had married a woman named Thelma LaFollette. Shortly afterwards, Harry returned from Canada and married Thelma’s sister, Thula LaFollette, even though he was seventeen years older than she. Joe returned to live with Harry and Thula; afterwards, Thula and Harry had a child, Harry Junior. When Joe was nine years old, the family’s house nearly burned down. Harry risked his life to save Nellie’s old piano from the fire. Afterwards, Harry moved his family northeast to a Boulder City mining camp where’d he’d worked as a master mechanic. For many, the mining camp was a dismal place to live, but Joe loved it. Thula, however, despised her new home: she’d been raised to be sensitive and artistic, and she excelled at playing the violin—now she felt ignored, and her hands were too cold to play an instrument. The passage portrays Harry and Thula as contradictory, volatile people. Harry was sporadically loyal to his child, but he had trouble finding work (as, indeed, millions of people did during the era). The fact that Harry married his daughter-in-law’s sister probably proved confusing for the young Joe, and may have further alienated him from his father. Thula seems more concerned with her own artistic ambitions than with taking care of Joe, who isn’t her biological son. While it’s possible to be sympathetic for Thula’s frustrations and anxieties about her future, it’s clear enough that Thula did an atrocious job of caring for Joe. Growing up, Joe developed a passion for gardening. His parents kept a small garden in order to feed themselves cheaply, and Joe was tasked with tending the garden. But Joe and Thula didn’t get along—eventually, Thula became so furious with Joe that she told Harry he’d have to choose between his wife and his son. Harry informed Joe, just ten years old at the time, that he wouldn’t be living in the house any longer. He arranged for Joe to live with the local schoolteacher, chopping wood to pay his way. Harry was, to state the obvious, a miserable father—he was more loyal to his young wife than to his own child, and when Thula forced him to choose between the two of them, he chose her. Although Harry didn’t abandon Joe altogether—he at least made arrangements for him to earn his food and shelter—he devastated his young son, forcing him to grow up without a strong, loving father figure. Joe’s childhood was sad, but it also trained him to be strong and take care of himself. He found little pleasures in the midst of his loneliness—for example, finding mushrooms growing on the side of the mountain. Joe grew up resourceful and self-reliant as a result of Harry’s callous decision to abandon him. Arn, Jackson. 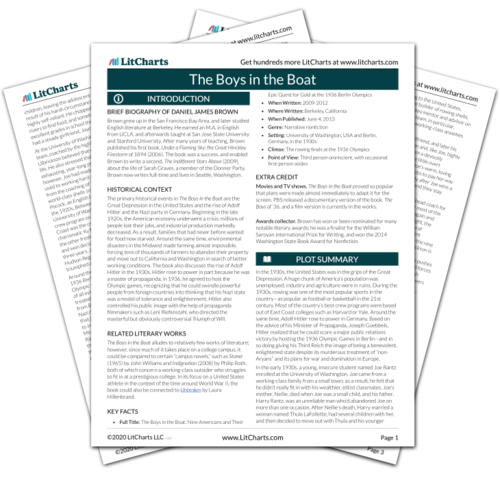 "The Boys in the Boat Chapter 2." LitCharts. LitCharts LLC, 5 May 2017. Web. 22 Apr 2019. Arn, Jackson. "The Boys in the Boat Chapter 2." LitCharts LLC, May 5, 2017. 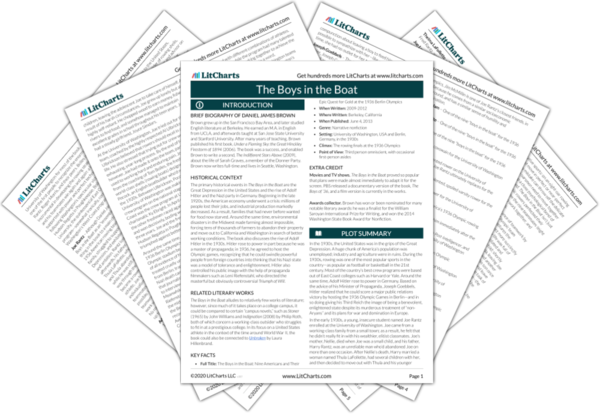 Retrieved April 22, 2019. https://www.litcharts.com/lit/the-boys-in-the-boat/chapter-2.